Bobby has a very interesting story to tell. The start of his journey began in Arkansas, where he had been hit by a car. He laid in a ditch for several days before a rehabber found him. After a lengthy time of rehabilitation, it was found that due to the extent of his injury he could never be again in the wild. His pelvis had healed, but not healed properly enough for him to be able to hunt. Bobcats, unlike other cats, when they leap onto their prey, instead of just leaping, HURL their entire body weight behind the jump, increasing the velocity of the hit. So that twenty pound cat becomes a 60 pound projectile. As a rehabber, you have three options at the end of the rehabilitation. 1. Release. This is your FIRST priority and ultimate goal. 2. Euthanize. If the animal cannot be released and does not do well in captivity, both physically and mentally, then euthanasia is the kindest option. 3. Transfer to a breeding or educational facility. Since bobcats are not endangered, it is not part of conservation to just breed a bobcat. 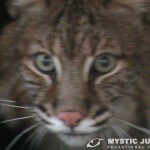 So the other option, is of course, an educational facility, such as Mystic Jungle Educational Facility. Bobby has adjusted well to captive life. He eats well, is VERY territorial over “HIS” house and is all that a bobcat can be. He is a wonderful ambassador to show our community what is in their back yard!